Inside a desktop casing, usually integrated circuits such as CPU, GPU sometime RAM are the main spreader of heat. There are many ways to reduce this heat using heat-sink, water cooling or air flowing, but it will worth using quality RAM cooler. This cooling is essential to remove over heat produced by this component to keep it within a permissible limit of operating temperature. High quality cooler is designed to reduce the ambient temperature of the RAM by exhausting heat and save it being damaged and keep it at its optimum level of workability. Star Tech introduces World class Cyclone 3 memory of Geil brand. 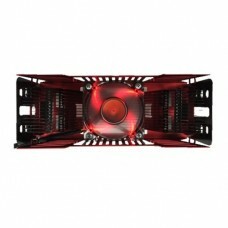 This best RAM cooler with 9.6CFM airflow of cooling fan is the prominent cooling device available at the best price.